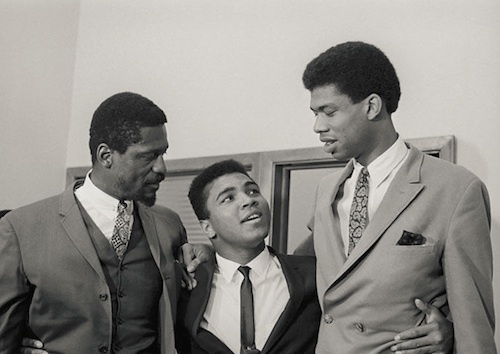 Bill Russell on the left; Muhammad Ali in the middle; Kareem Abdul-Jabbar on the right. FNN CELEBRATES BLACK HISTORY: FEB. 3, 2014. Who is Bill Russell? Most may reply 11- time NBA champion. Some might say the winningest athlete in team sports. But how many of us know William Felton Russell for his off-the-court actions. How many of us know that he was an instrumental figure in the desegregation movement. Some even compare his efforts to figures like Muhammad Ali and Hank Aaron. Basketball was simply what Bill did well. Yet he was more than a basketball player. He is a successful mentor for youth and used the stage he had to propel the desegregation movement. He opened and ran the first basketball camp of mixed race in Jackson, Mississippi. He’s also an important figure in Muhammad Ali’s refusal to enter the Vietnam war. Ali refused because it was against his religion. Russell was an instrumental figure in the meetings which helped prevent Ali from going to war. He even marched with Dr. Martin Luther King in the famous 1963 March on Washington. His life achievements resulted in Russell being awarded the Presidential Award of Freedom in 2011 by President Barack Obama. Obama was quoted saying “I hope that one day in the streets of Boston, children will look up at a statue built not only to Bill Russell the player, but Bill Russell the man.” On November 1st, 2013 the unveiling of the Bill Russell commemorative statue was held in Boston. It was quoted long overdue, and it was. Bill Russell has been overlooked as an activist because of his on-court achievements, but in the end his achievements to advance civil rights, far outweigh his 11 rings in 13 NBA seasons, or voted 12-times to the all stars and even being voted the most valuable player 5 times. Eric King is a sophomore at Friendship Tech Prep Academy.